What is a Form 1096? 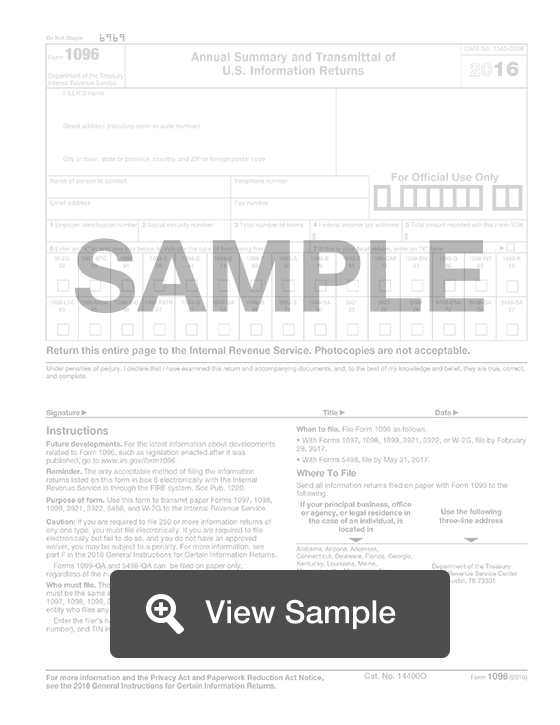 This form will be used by the United States Internal Revenue Service for tax filing purposes. Form 1096: What Is It? This form will be used by the United States Internal Revenue Service for tax filing purposes. A Form 1096 is also known as an Annual Summary and Transmittal of U.S. Information Returns. Tax-exempt organizations will use this form to transmit various forms to the IRS. These forms could be a 1099, 1098, 5498, or a W-2G. This form will require the personal information for the filer. This includes name, address, contact information, and a tax identification number such as a social security number. The amount of Federal tax withheld will need to be listed, as well as the total amount of money being reported on the form. The forms that are being transmitted should be checked off, and the total number of forms should be included. This will ensure that the IRS knows which forms to expect, so tax filing can be a smoother process. Create a free Form 1096 in minutes with our professional document builder.